I wasn't really too sure what this book was all about when I first started it and I'm ending it still feeling confused, but I think its a good confused? I don't really know how I feel about this one. 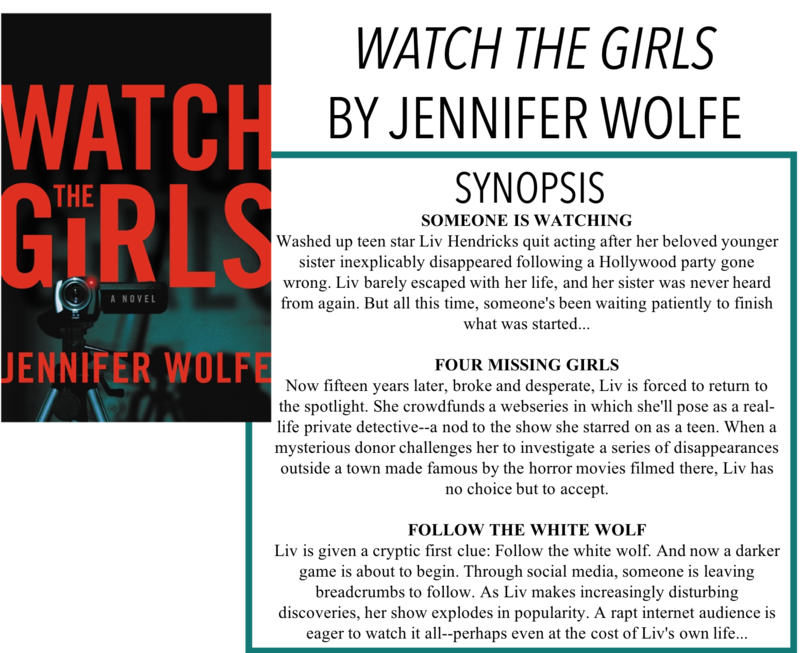 I am back with another book review, Watch the Girls by Jennifer Wolfe. Thanks so much to Hachette Books for sending me a copy of this book for an honest review, as always, all opinions are my own. After growing up as a child actress, Liv has had enough. Her momager has pushed her too far and after a drunken interview, it seems that the 32-year-old TV and movie star has seen her last on-screen appearance. She's fired from her TV show, a Scooby-Doo knockoff marketed to adults and turns to Shot in the Dark, an online crowdsourcing site to help pay her LA rent. Having played many investigators on-screen before, Liv decides to take on the mystery of the highest backer, which ends up being the mysterious Jonas Kron, a successful director whose niece has gone missing in Stone's Throw, the setting of many of his eclectic horror-noir movies, following the pattern of many missing women over the last 15 years. Liv soon finds herself mixed up in something way outside her depth and finds there is something quite sinister about the people in Stone's Throw. I really enjoyed seeing a thriller/investigative novel from the POV of an 'outsider' who wasn't a trained detective. I know it might seem a bit unorthodox, but Liv gave a fresh take on the somewhat overdone sub-genre of crime thrillers. She worked a little with local law enforcement but there was never that depiction of a precinct - and it's politics - that you often get with crime thrillers. I thought her 'investigative' skills were pretty good and seemed well within the reaches of an amateur. I think using this concept in an adult thriller, as opposed to a YA thriller, gives it more of a leg to stand on because it seems more plausible that an adult would be allowed to do some of the things Liv does. The plot really threw me for a loop. Not only were we contending with the strange goings on of Stone's Throw, but we also get flashbacks from 15 years ago when Liv's younger sister, Miranda, disappeared. I will say that I liked the present day plotline better, but by the end of the novel, it becomes clear that we needed this backstory for what happens next. This book seems like its going to be a whodunit? sort of thing but then you get more and more of the story and it just becomes this sort of strange Nordic noir set in California. I'm not sure that worked for me all of the time but it worked enough of the time for me to get through the book. There were definitely some moments that kind of freaked me out, and I generally don't spook easily in books. I think they were important to the story, but I would say maybe don't read this one at 1 am when you're home alone. It's not a constant terror, but when there is a scene that comes up, you're going to want daylight. Despite everything, I'm still not sure if I ~liked~ the book. There were parts I liked and parts I didn't, and I think there are moments that, for better or for worse, will stick with me, but I'm just not sure what my overall feelings are yet.